I first made a start growing things when I was 11 years old, this was a few vegetables during the war, a few years later breeding fancy rabbits some for showing others for the table became an interest. 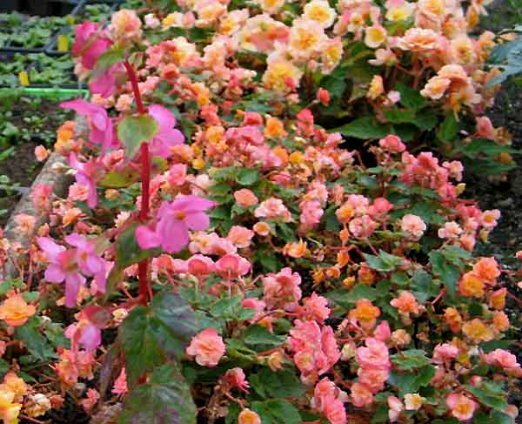 This moved on after I was married to breeding and showing Canaries, after growing Fuchsias I bred a number which enjoyed a period of popularity probably the reason I still enjoy trying to develop new varieties of Begonia. 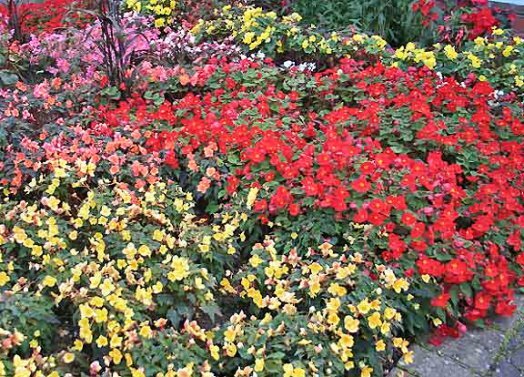 For a long garden display I think the various tuberous begonias cannot be beaten, and with the numerous multiflora varieties I have in my collection, this enables me to do something slightly different every season. 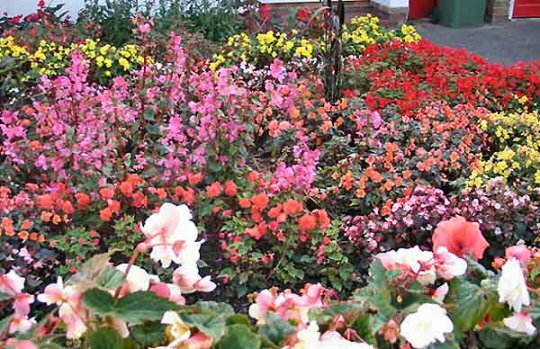 With a few pictures and a few words, I hope to show how I grow and plant my various garden Begonias, although many growers will do things in a different way which pleases them and makes some great gardens. 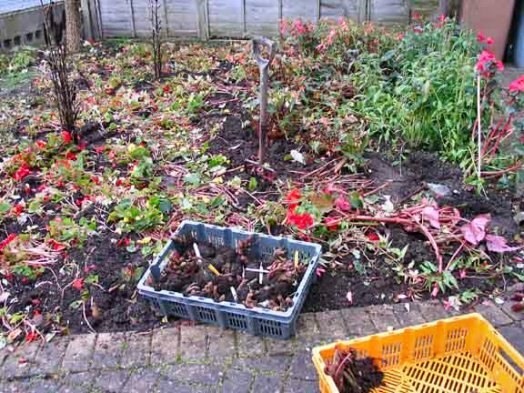 By the middle of the month many of the plants were looking tired so a start was made taking them up (Image 62); many of the stems fell off as the plants were dug from the ground. All the foliage was left on the surface (Image 63), to be dug in as can be seen in (Image 64), being composed mainly of water all the leaves and stems soon break down once buried. 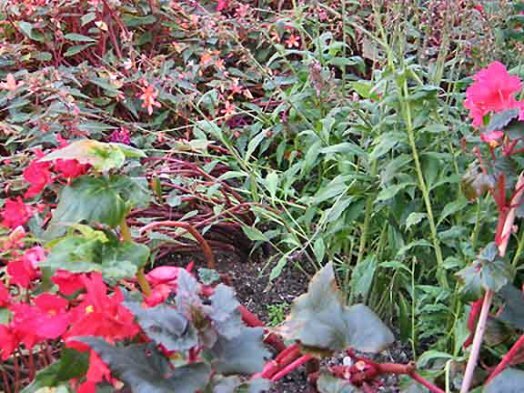 The next few pictures show the benefit of placing plants deeper in the soil when planting out in the beds, if the leaf axils are covered with soil many small tubers are often produced at the leaf joints. 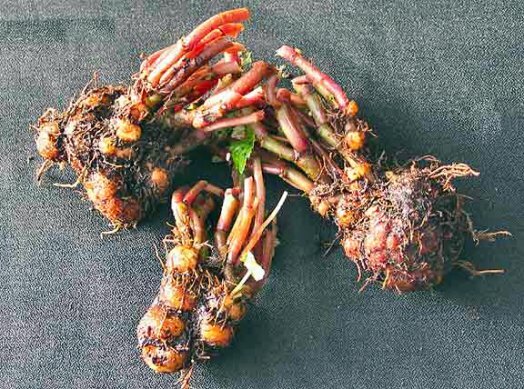 The tubers shown (Image 65) are “Le Flamboyant” this variety produces more small tubers than other varieties, but it is still worthwhile planting other varieties deeper as small tubers are also produced by these. 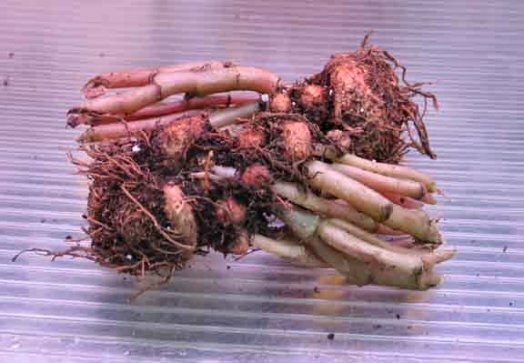 An example of this is the tubers of “Madame Richard Galle” (Image 66) many of the small tubers produced can make good plants for beddings out if they are started off early in February; this gives them a chance to make decent plants by the end of May. 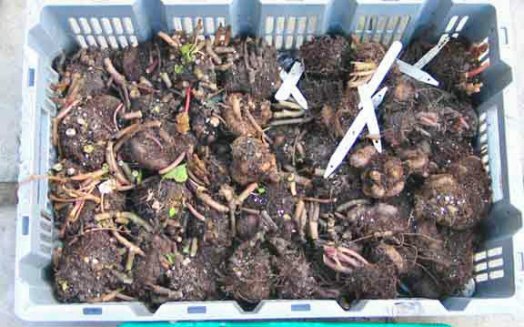 This can be a simple way of building up stock; and having spare tubers is always a safeguard to replace any tuber losses during the winter. 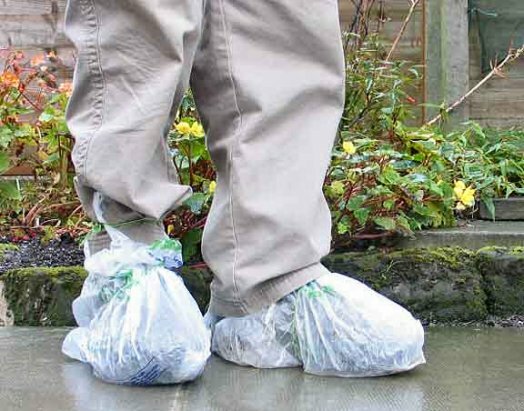 One of the jobs that can take up a lot of time is cleaning ones boots following walking and digging in the soil, a way to make life easier is to wrap your boots with a plastic shopping bag. (Image 67). The bags can sometimes last for a couple of sessions of digging; they can then be discarded saving the time it would have taken to clean up your boots. (Image 68) Shows 3 different years of the Hollyhock begonia, the first part is this seasons bulbils, the small tubers of the middle group are tubers that have been grown from last seasons bulbils that came up in the garden. The final group being tubers from the plants that had flowered in the front garden display, a number of these have split into more than a single tuber. In some cases the old tuber has rotted but a new tuber has grown at the side of old tuber. 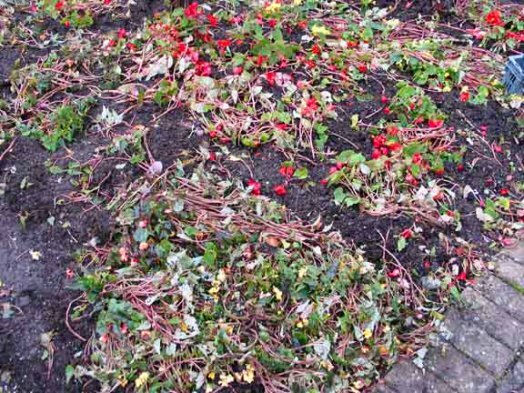 Almost all the garden begonias have now been housed; the tops that were broken off from many of them are now falling from the tuber a week after being taken up. 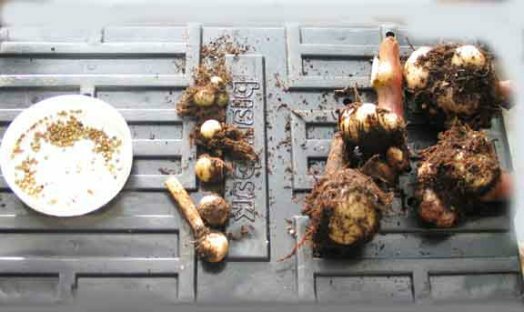 This can be seen in the trays of tubers taken up (Image 69), these are now ready to clean away the fallen tops and as they dry they can have the compost cleaned off with a soft brush. 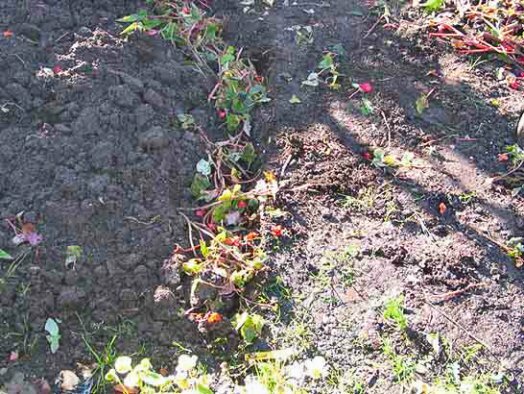 It is a mistake to start cleaning off the old compost too soon as the tuber skin requires time to harden off, trying to get the job done early can result in rubbing off the soft outer skin resulting in bare sections without roots next season. This is a job that will be dealt with over the next month or so. 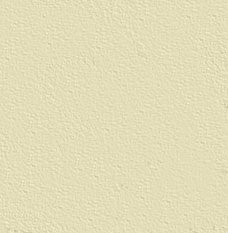 There is very little I can add to what has already been written, so this is the final page of the diary but should any NBS members want any further information or would like to make any comments, my phone number is on the help page in the bulletin and I would be very happy to hear from you. The display in the front garden was badly damaged following the 24 hour period of heavy rain we had in the North West in the early part of the month. The taller plants at the rear of the display (some had reached 3 feet), (image 52) and many of the Hollyhock begonias (image 53) collapsed with the excess water on the foliage. I had thought of tying many to canes early on, which shows you should get on with such jobs when you think of them. Even “Yellowhammer”, which is a more compact variety, has some damage, but in spite of these setbacks there is still a lot of colour to be seen. 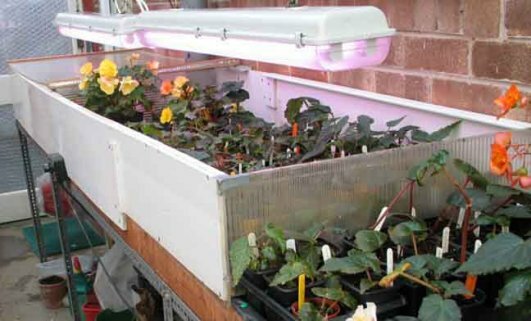 The plants are now thinning out with the shorter day’s (image 54) and start their final period of growth, now switching to tuber development; the top growth will eventually yellow and finally die back. 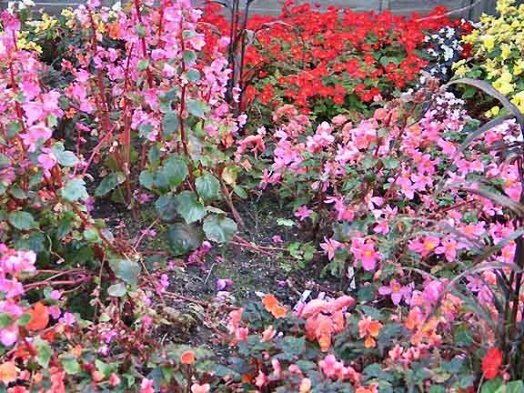 Le Flamboyant is still looking very colourful (image 55) and as usual at this time of the year mildew began to show, another treatment with a fungicide eliminated this very quickly. 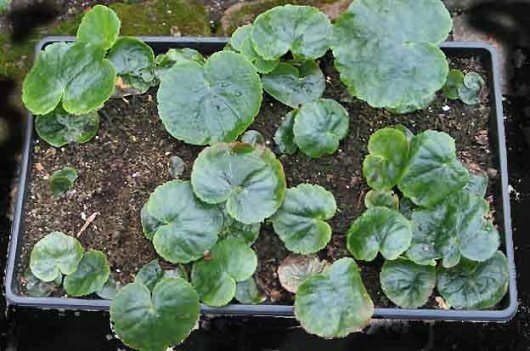 The bulbils are now developing quite fast on Begonia; gracilis martiana (hollyhock begonia) and fall all over the garden, many will grow the following season some even flowering as the next image shows (image 56). 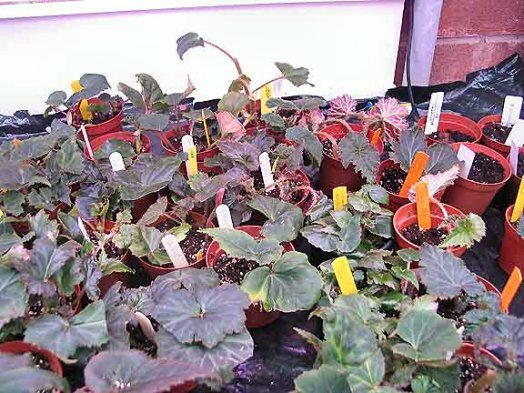 I have collected quite a number that had started into growth, these have been planted in seed trays (image 57) to grow and develop their tubers for planting out next season. A few are showing tuber development at the base of the foliage (image 58), they should make good flowering plants next summer much better than growing from bulbils in the spring, as they are stronger and taller coming into bloom earlier. They have even been transported in some old compost I take to my youngest Daughter in Milton Keynes to improve her soil, they have grown and flowered there by August. 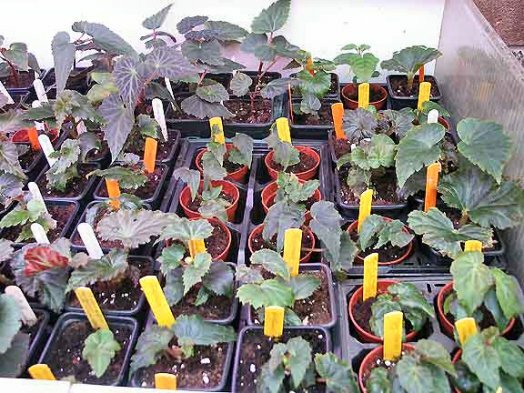 Another long job that will hopefully ensure that tarsonamid mite does not survive through the winter, is to spray all the plants and cuttings with a mineral oil and washing up mix. 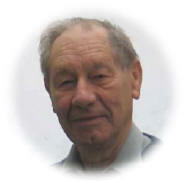 Speaking to Ralph Willsmore in Australia last week he told me that the formula he uses is 100 mil oil plus washing up liquid to 5 litres of water, as I am not trying to cure an infection but using it as a preventative, 50 mil is the amount I am using. 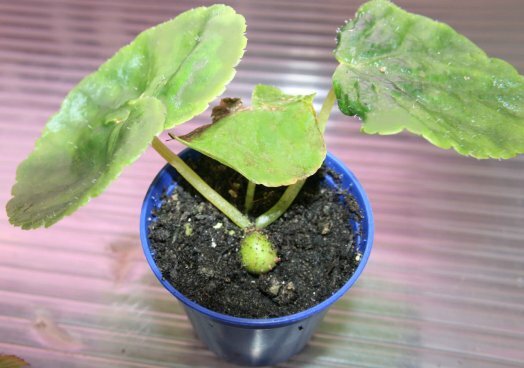 The Ambyselius mite will still be applied in the spring to kill off any that could cause a problem next season.